Reproduction. WW2 Style. 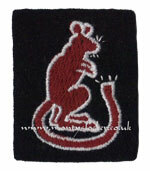 Machine embroidered thread on a wool cloth background with hand embroidered finishing. Manufactured by Monty's Locker. Badge worn during the North West Europe Campaign and for D-Day Landings. If you require the earlier version worn during Sicily and Italy please see related products below.